Pastor Ric Koehn (standing on the right with Rev. James Mwoho, a district superintendent) of the Paynesville United Methodist Church recently attended the East Africa Annual Conference which consists of five African countries. Koehn was gone Aug. 9 to Aug. 24. "Someone in the United States delegation changed their mind about attending and I had the good fortune of being asked," Koehn said. "I wanted to attend the conference to learn how we can best help our fellow African pastors and their churches," Koehn said. This was Koehn's third trip to Africa. He has been there before on mission trips. The conference was held in Naivasha, Kenya. Countries represented at the conference were: Burundi, Rwanda, Uganda, Kenya, and Sudan. Koehn said he spent four days in Uganda before traveling to Kenya for the conference. "We were dropped off in Narobi and had to find a ride to Naivasha or stay overnight in a motel. My traveling companion and I wanted to head straight to Naivasha. We bargained with a bus driver and conductor, who were passing by Naivasha, to drive into the city and take us to our hotel," Koehn said. "We ended up paying a total of $10 for our ride." The conference lasted four days and on Friday, Koehn attended a consultation (school) for African pastors. "There were 75 delegates attending the conference. I was the only white man in attendance," Koehn said. "It teaches you what it's like to be in the minority," he added. 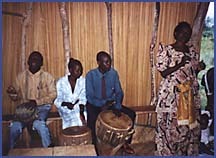 This is an African United Methodist Church where the musicians performed in a bamboo structure with a tin roof and dirt floor. Besides Koehn there were five others from the United States attending, four from the New York office of Global Ministries. Koehn describes Naivasha as a city with businesses the size of Paynesville but he estimated the population at 20,000. The main road is the only paved road in town, the rest of the streets are dirt. Koehn said the United Methodist Church in Africa is fairly new. In Kenya, the church is only two years old and in Rwanda it is fairly young. The church presence in Uganda was started in 1992 but it is not considered a registered church. "The church in Africa is relatively poor but is really alive. Everybody has so many needs. Their enthusiasm and faith is unbelievable," Koehn added. He attended two church services in Uganda which lasted two and a half hours each. "The services didn't seem that long as the music was spirited and different. Guests attending the service were asked to stand up and introduce themselves." "The church in Africa has so many problems it would be hard for people here to relate. There is a lot of politics involved. Bishop J. Alfred Ndoricimpa is living in exile and wants to go home. However, the church board is concerned for his safety and that of his family," Koehn said. Koehn explained government officials see any little thing that the church does as being a subversive act of rebels. "Pastors there are walking on thin ice," he added.